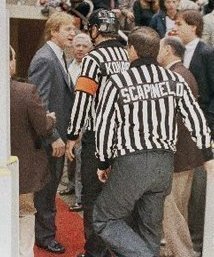 On May 8th in 1988, replacement referees dressed in New Jersey Devils Cooperalls and yellow jerseys took the ice at Brendan Byrne Arena for Game 4 of the 1988 Conference Finals against the Boston Bruins when NHL officials exited in protest of a court-order injunction staying John Ziegler's suspension of Jim Schoenfeld. 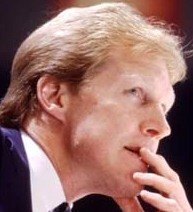 The one game suspension emanated from a post-game altercation between Devils head coach Schoenfeld and Game 3 referee Don Koharski where incidental contact between with the two caused the referee to slip and remark "you're done" to which the bench boss retorted "you fell you fat pig, have another doughnut". The incident was famously parodied four years later in Saturday Night Live star and renowned hockey fan Mike Myers' movie Wayne's World in which Frederick Coffin played Officer Koharski, a character who frequented the film's fictional coffee shop named Stan Mikita's Donuts. The Devils beat the Bruins that night by a score of 3-1 but eventually lost the series in Game 7. Shoenfeld was suspended for Game 5 and received a $1,000 fine while the Devils were docked $10,000. Koho and Schony later became good friends despite the doughnut diet indignity.